Andre Gray has welcomed Burnley’s pursuit of former team-mates James Tarkowski and Alan Judge. The Brentford pair have been the subject of bids from the Clarets during the transfer window, though both offers have since been rebuffed by the Bees. But the saga surrounding 23-year-old defender Tarkowski took a twist after a £2.3m bid was turned down. The former Oldham man was absent from Friday night’s fixture at Griffin Park after refusing to play. Meanwhile, one-time Rovers midfielder Judge netted a consolation for the Bees as Sean Dyche’s side cemented a third successive win on the road with a 3-1 victory. 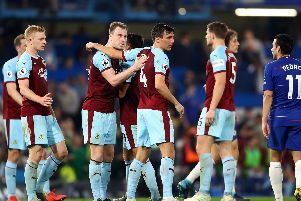 After spectacular strikes from Scott Arfield, Joey Barton and George Boyd secured maximum points on his return to his former club, £6m record signing Gray, signed on the eve of the first meeting between the two teams in August, said: “I know there’s a lot of speculation but they would be great additions for us. Of Tarkowski’s decision not to play, Gray said: “Someone mentioned it, but I don’t think it affected them. “I’ve been in that changing room and I think they understand that’s just football. “You don’t know what’s happened behind closed doors (with Tarkowski). It might be more complicated than their fans think.